Some 60 years ago, Desmond Cory wrote the first of a series of thrillers that helped spawn one of Britain's most popular fictional genres - the 20th Century "Spy Novel". Sometimes referred to as "Brit Grit", this phenomenon comprised several well-known characters such as Ian Fleming's James Bond, and Len Deighton's Harry Palmer. At its peak, the genre sold several million books across the world, and was watched by even greater numbers on the Big Screen, due to the immense popularity of James Bond, as incarnated by the incomparable Sean Connery. 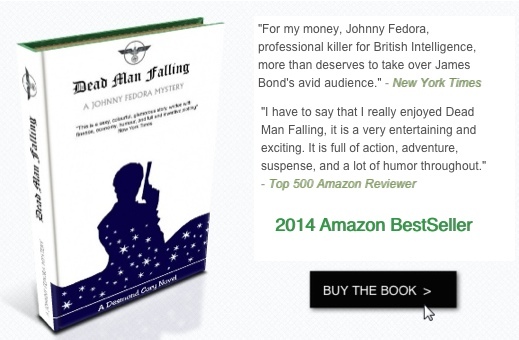 Preceding the now legendary 007 was Desmond Cory's Johnny Fedora, "the thinking man's James Bond". 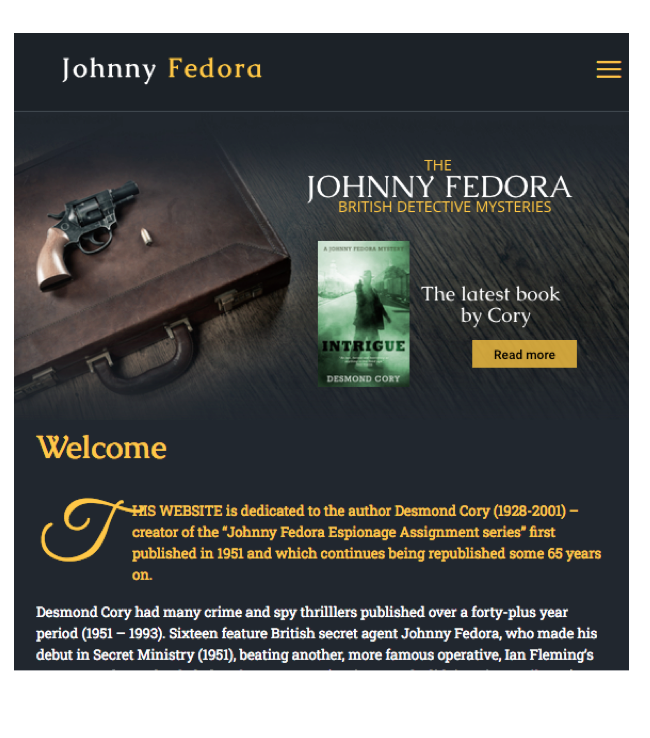 This Web site is dedicated to Shaun McCarthy (aka Desmond Cory) - the author, the characters he created, the novels he wrote, and his other literary achievements.. It's great to see Dead Man Falling in the BestSeller lists again, running along side other great popular authors such as Jo Nesbo and Janet Evanovich. Our thanks to all the readers purchasing this book and leaving their reviews on Amazon - there are now over 140 reviews .. and still counting ! New Desmond Cory novel - first publication of On The Gulf on Kindle. Desmond Cory's Lindy Grey novels now available on Amazon Kindle. Ostara Publishing publish new interview with Desmond Cory. A hitherto unpublished interview with Desmond Cory has been released with the new pubication of Undertow by Ostara Publishing. In the interview, Cory reveals where he got his pen-name from, and who inspired him during his early years as a novelist. View the full interview. over 45 thriller /detective novels published in over 10 languages (winning accolades such as the Sunday Times' Best Crime novel of the year, and Crime Critics' choice of the year. screen-plays for the movie adaptation of Graham Greene’s novel "England Made Me". As a Professor of English Literature, he wrote academic papers on modern English literature, and taught at a number of international Universities. Desmond Cory was born in Lancing, Sussex on February 16th 1928. He was educated at Steyning Grammar School, and after serving as a commando in the Royal Marines immediately after World War II, he studied English literature at St Peter's College, Oxford, graduating with Honours in 1951. He pursued an academic and literary career for the next forty-five years, and in 1976 was awarded a Ph. D. from the University of Cardiff, Wales. Starting as a freelance writer, he moved in 1953 to Cordoba, Spain, where he served as a technical translator and began teaching for the Academia Britanica. In Spain he married Blanca Rosa Poyatos, and became father to 4 boys. Cory taught throughout most of his life, first at the University of Cardiff, and then enjoyed a series of associate professorships of English Literature in Arabic-speaking countries such as Qatar, Bahrain, and Yemen. He then became an advisor to the Ministry of Education in Salalah, Oman before leaving the Arabian Gulf in 1990 to take up a university position in Famagusta, Cyprus. In 1996 he retired with Blanca Rosa to their home in the province of Malaga in Southern Spain. Despite his very busy professional life as an academic, Cory was a prolific writer whose work evolved and matured throughout the years, culminating in "The Dobie trilogy" published between 1991 and 1993. At the time of his death in January 2001, he left several unfinished manuscripts. Shirley Bassey, like Cory, lived in the Cardiff area. They met a number of times, and Shirlie Bassie sang one of the main songs in one of Cory's filmed novels. Listen to "My love has two faces" and the 5 minutes of the film DeadFall. © Desmond Cory., All rights reserved.